Explore creative DIY ways to reuse egg cartons once you've devoured their contents for breakfast. After you’ve fried up a few Western omelettes, topped them with Tabasco, and nourished your body with nature’s best source of protein, there’s a sturdy little cardboard container awaiting your creativity. Here are five cool ways to reuse egg cartons. Why settle for a single plant when you can enjoy 12 different varieties? 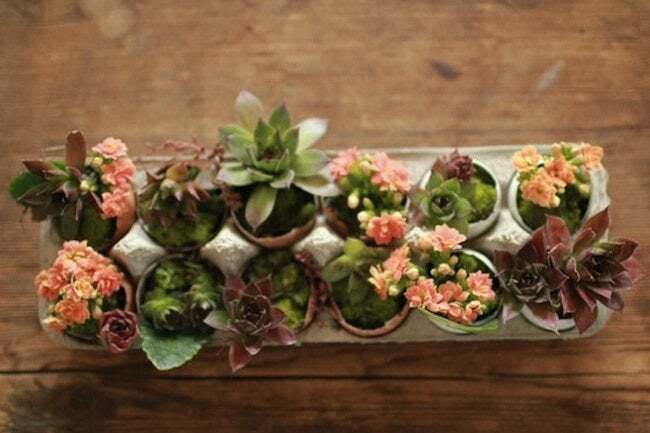 Creating an eggquisite multi-planter is a great way to reuse egg cartons. The project makes sampling several seeds as simple as scrambling an egg, and the result can fit right on your sunny window sill. Paint the outside or decorate it with arts and crafts supplies, then watch your mini garden bloom! 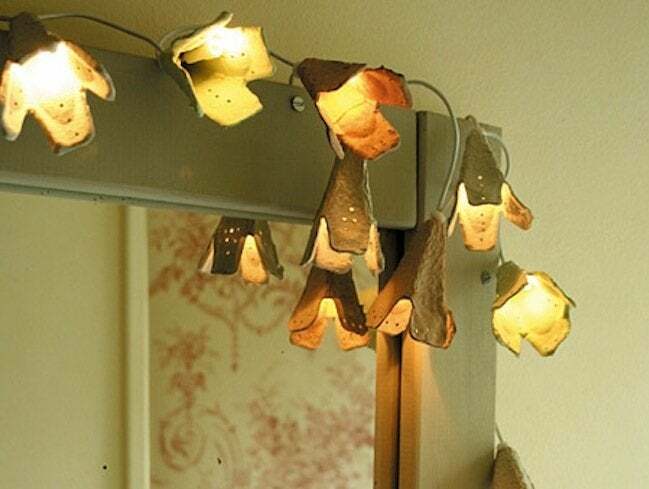 Reuse egg cartons to transform string lights by making a “lamp shade” for each bulb. Customize the shape, color, and design of your shades in keeping with your taste and the nature of the occasion, be it the holiday season or your loft apartment’s everyday luminescence. Any room is bound to exude egglegant radiance under the glow of this whimsical approach to DIY lighting. So your desk is a mess, huh? 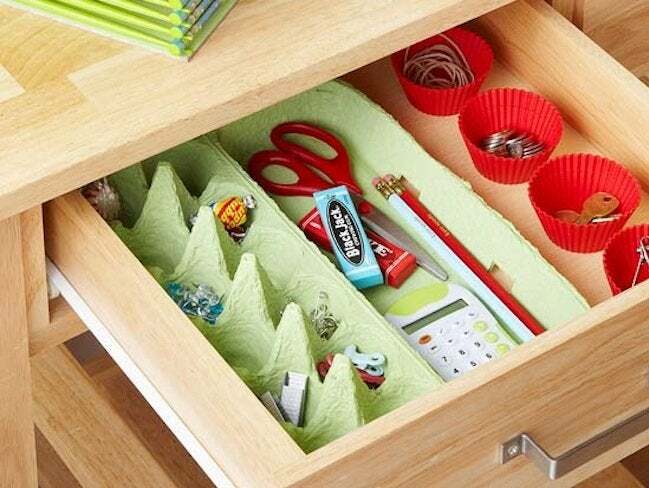 Instead of shelling out money for run-of-the-mill office supplies, you can easily reuse egg cartons to craft your own unique (and free) drawer organizers. Hollow out the cartons to make room for larger items like staplers or scissors, or store a different item (pins, paper clips, loose change) in each of the separate egg cradles. If you’ve gotten tired of the usual cork and pegboards, maybe you ought to whisk things up a little. Here’s a fresh and offbeat idea: Reuse egg cartons to make your own all-purpose bulletin boards. 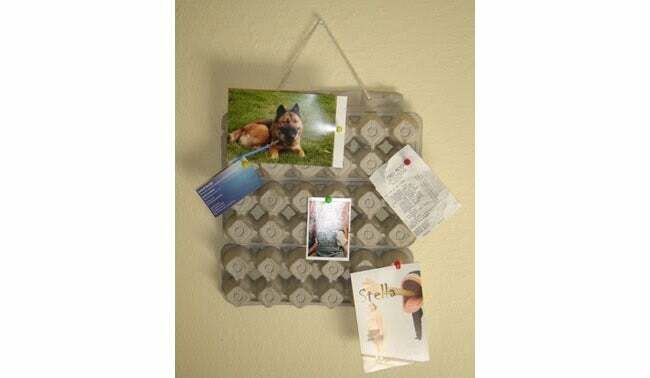 Cheap and easy to complete within minutes, these light-as-a-feather catchalls for phone numbers, business cards, and photographs can hang in the kitchen, home office, or garage workshop—anyplace where you could use a little memory aid now and again. 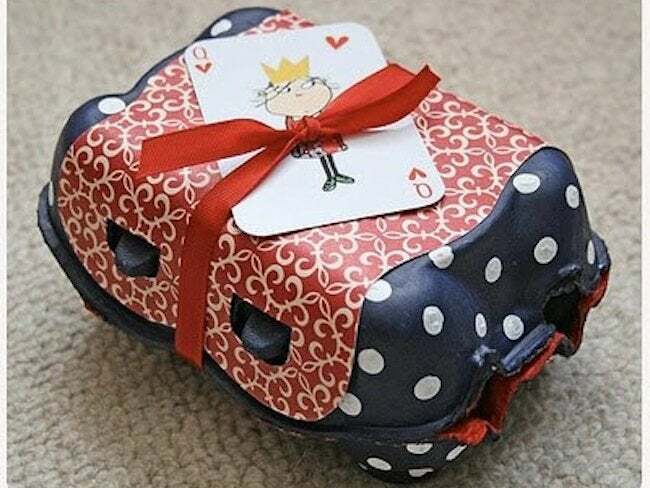 Finally, reuse egg cartons to package your presents in something other than a predictable parcel. Just slice your carton in half, then add your own custom design. What you get is a snazzy gift box that protects fragile items in transit. All this talk of eggs must have you craving some. Well, eat up. Now you know there are plenty of ways to reuse egg cartons after you’re done devouring their contents. Hurry up and get cracking: Last person to make one of these creative repurposing projects is a rotten egg!